Somali Pirate King-Pin Afweyne Retires - kaycee Weezy! One of Somalia's most notorious pirate leaders who terrorized vast areas of the Indian Ocean, generating multi-million dollar ransoms from the ships he seized, has announced his retirement. "After being in piracy for eight years, I have decided to renounce and quit, and from today on I will not be involved in this gang activity," Mohamed Abdi Hassan, known as "Afweyne" or "big mouth", told reporters late on Wednesday. Last year he was described as "one of the most notorious and influential leaders" in Somalia's pirate-hub region of Hobyo, in a report by the UN Monitoring Group on Somalia and Eritrea. His men were reportedly involved in the 2009 capture of the MV Faina, a Ukrainian transport ship carrying 33 refurbished Soviet-era T-72 battle tanks, and which was released after a 134-hijack for a reported three million dollars. He was also reported to be involved in the 2008 capture of the Saudi-owned Sirius Star supertanker, also released for a ransom of several million dollars. Afweyne did not provide a reason for his change of craft, but speaking at a ceremony in the central Somali region of Adado, he said he has also been working to persuade other pirates to follow his example to quit sea banditry. "I have also been encouraging many of my colleagues to renounce piracy too, and they have done it," Afweyne said. Somalia has been ravaged by a relentless conflict since 1991, and a lack of effective central authority has allowed pirate gangs, extremist militia and other armed groups to control mini-fiefdoms. 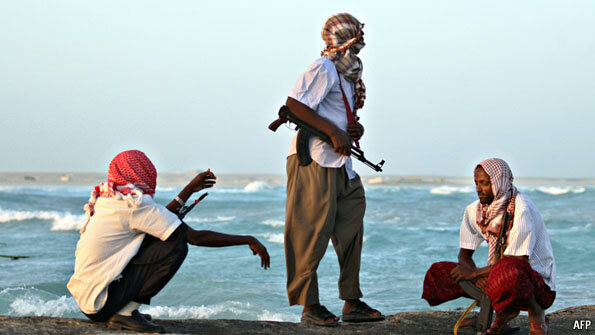 However, piracy attacks off the coast of Somalia have plummeted to a three-year low thanks to beefed up naval patrols.